Optimal Recoating materials are inherently different from Primary Coating. The reason is that the requirements for a good recoating material are materially different, and even contradict, the requirements from a good primary coating. MY POLYMERS is taking part in China LWOP Exhibition, March 20-22. See us at booth #W3.3149 presenting our wide selection of low index optical fiber coating and re-coating materials. Distinguished by its total focus on low refractive index polymers, MY Polymers is a leader in this field. MY Polymers specializes in low index optical fibers primary coatings (cladding resins) and re-coating materials. Our customers include the leading manufacturers of specialty optical fibers, fiber lasers and photonic components. Other fields of use include biophotonics, electronic displays, and lighting systems. 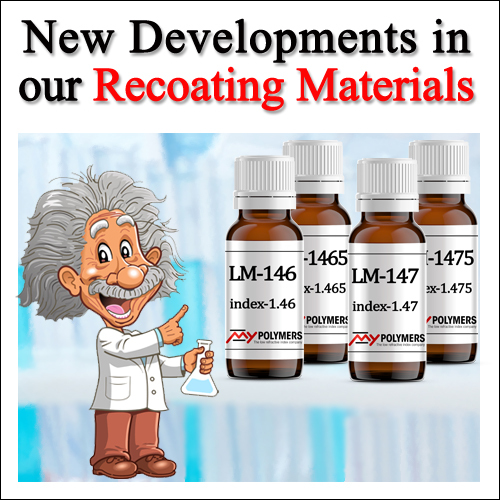 Our low index materials cover the whole range of refractive index from 1.30 to 1.50. Our materials are sold in North America, Europe, China, Japan, Taiwan, Korea and other countries with leading photonics sectors. copyright (2012-2016) My Polymers "The low refractive index company"